Sandhill Cranes returned to southern Indiana early this year. Typically, I have not seen them until the last week of December or early January. We heard a small group near our house in Bloomington on Thanksgiving afternoon, but could not locate them. We also heard a group as they flew east to west a few weeks ago. I ventured to Jackson County twice earlier this month. The first time we found the Sandhill Cranes just south of Seymour. On my second trip, they were further west on either side of state highway 11 near the airport. Unfortunately, there was no place to park and the speed limit was 55 MPH, so I decided not to stop in the middle of my lane! I drove further south, but had no luck in finding additional cranes. After lunch, I ventured to Ewing Bottoms, but after slowly going through two ponds on the road, I stopped at the lake covering the road and turned around as did the car behind me. I did not see any cranes in the area. This photo is my first of an immature Sandhill Crane. The parents were nearby so I was able to isolate the individual bird. I did not see many birds in the area, only groups of 3-5; however, they were close to the road. In between my trips to Jackson County, my wife and I made a trip to Goose Pond. We saw a flock of white birds in the distance, but no other birds on the water. As my wife said, “Not even a coot!” As we were leaving, we say a few groups of Sandhill Cranes circling very high in the sky. I have heard several reports of reduced numbers of ducks stopping in this area. 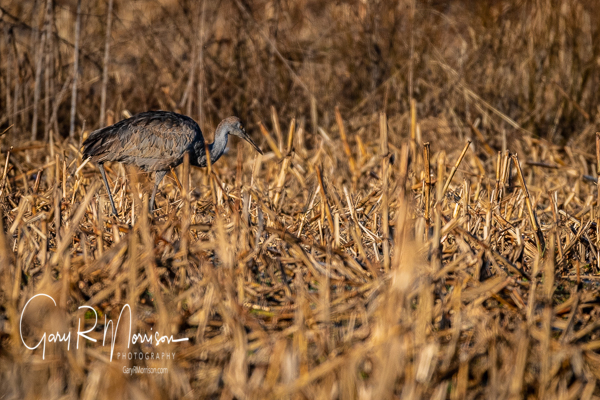 I noticed that the vast majority of Sandhill Cranes have left Jasper-Pulaski, but my sense is that the population in Jackson County is lower than past years. Is it too warm for many of the migratory birds? Hopefully, they will return in January when it gets colder.